WOW - What a busy week it's been and what a busy month still ahead! Top of my list is (no surprise) the Pink Boat Regatta!! Buy a buoy and let's FIND A CURE! Thank you Bellingham Yacht Club... WE DID IT! Together, at the Friday Night Pink Boat Regatta Steak Night, we raised nearly $2000 in dinner, drinks, donations (thank you very much all of you who donated extra), and t-shirt/hat sales. WE ROCK! It's not too late to register your boat for the regatta (happening Sunday, 30 August @ 1pm) - the weather looks great! Can't sail?? Buy a buoy! 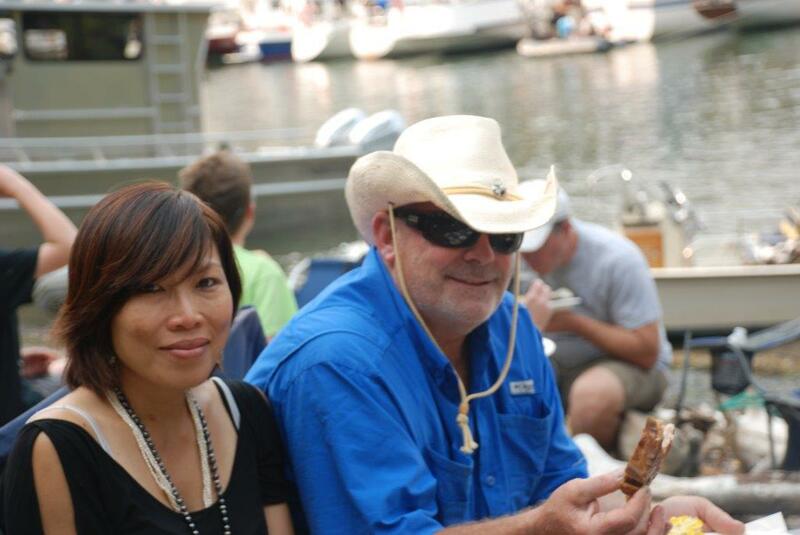 Whether you sail or not, be sure to come to the Club at 4pm for an evening of BBQ goodness and the musical sounds of Joe and Carol Young and of course, more of those specialty drinks concocted by our very own Scott "Proud to Wear Pink" McEniry. Admission to all of this fun is a paltry $5 donation to the Breast Cancer Research Foundation. SAVE SECOND BASE! Congratulate Fleet Captain Jim Gibson! At last week's board meeting, I appointed Jim Gibson to fill the Fleet Captain vacancy left by Donna Olsen who resigned last month. 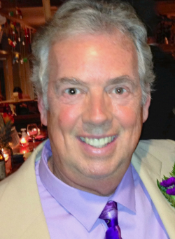 Jim is a great choice for this position since he has been an active member since joining the club in 2002. Jim owns and races 2 different San Juan sailboats, SJ24 and an SJ7.7. He has served on the Policy & Planning Committee, co-authoring our Employee Manual and Code of Conduct Policy, and was engaged with last year’s extensive Financial Management Review (audit) Committee. He has assisted the Youth Fleet in employment and policy matters, and is heavily involved in the club’s charity regattas. Jim will have completed his second year serving on the BYC Board, which make him eligible to run for Rear Commodore in the upcoming elections. Blue West Marine offshore auto inflatable lifejacket. 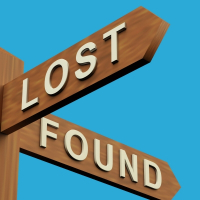 Used for Etchells racing last Wednesday and not seen since. Left around the club somewhere. Please call Randy Nulle if you find it. My last name is on it. Wednesday September 16 - Elections –VOTE!!! If you are interested in running for the Board, please contact me commodore@byc.org , 360-303-5465 or the Nominating Committee. 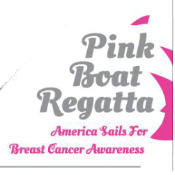 Want another way to help with the Pink Boat Regatta that doesn't involve sailing? If you knit, you can help. Barb Demorest of Knitted Knockers visited us during steak night with a presentation about this great way to get involved and help women as they heal after surgery. While we work toward the cure, you can help make lives better. Visit www.knittedknockers.org or stop by the BYC bar for Barb's business card and a pamphlet. After the BYC Nominations there will be a BYC General Membership Meeting. There will be a couple new By-Law Changes that must be voted on by the General Membership, as well as an opportunity to talk with the BYC Officers and Trustees and voice any concerns. Remember -- No fires at Inati Bay until further notice. Thank you for your cooperation!! The Buccaneers’ Cruise to Inati Bay was a great success, thanks to the work of Nicole and Adam, who generally organized things; Bruce, who cooked over a hundred chops and dogs; Monica, who provided crab tostadas, and numerous others! Gary’s band put on an outstanding show and the weather person cooperated by providing a perfect weather venue for the outdoor festivities! This week it’s the Pink Boat Regatta on Sunday! If you’re not signed up, think about doing so — there’s still time and it promises to be another great event! THUR: Monica’s away this week, so it’s burgers hot off the grill! FRI: Come on down and visit with friends over a libation or two as you get set for the weekend events! SAT: Bar and lounge opens at 5! SUN: Pink Boat Regatta - Get your PINK on and come on by the lounge! Doors open @ 3:30 (ish). 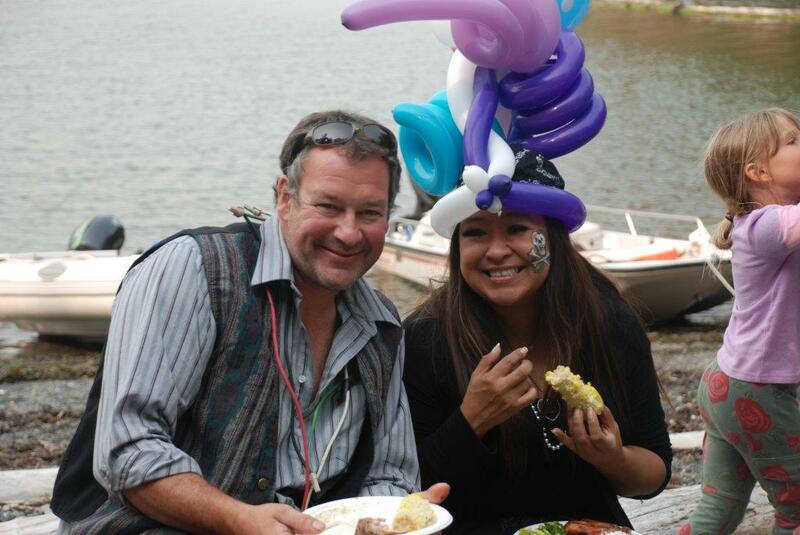 Two great events over the weekend with one goal: Having fun around boats and the water. While I wasn't at the Buccaneers Cruise, I have reports that plenty of young mariners had a great time at Inati Bay over the weekend. Meanwhile for the kids that like to race, we had the Northwest Junior Olympics hosted by the Seattle YC. The BYC race team had 13 sailors representing with two coaches and family back-up to move the whole circus to and from the event. We entered boats into the 29er, FJ, Laser standard and Opti fleets. Our best results on the board were the 29er team of Liam Hood and Shea Walker finishing third. All other sailors had a great time and learn't a bit more about sailing regattas with larger fleets. Thanks to our coaches Miles Johannsen (advanced team) and Megan Link (Optis). 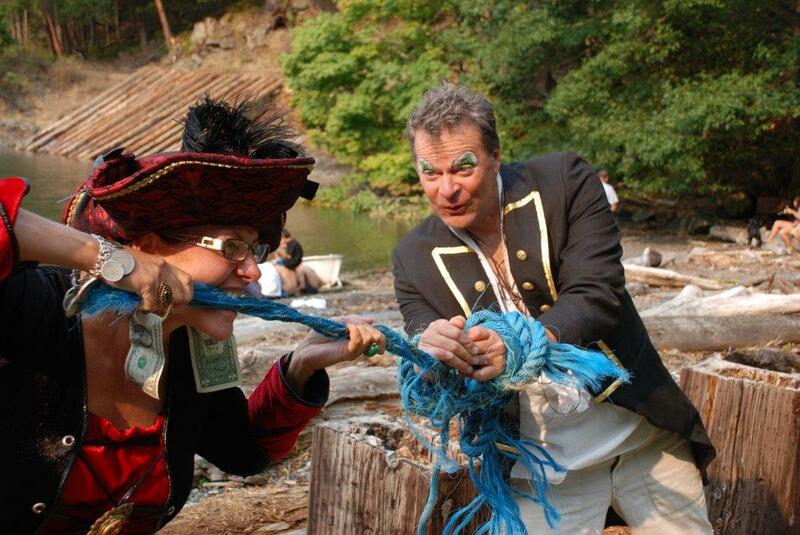 Next youth regatta is JAM on Bainbridge Island Sept. 12-13. Once again we will be holding our annual PITCH regatta on September 5 & 6. 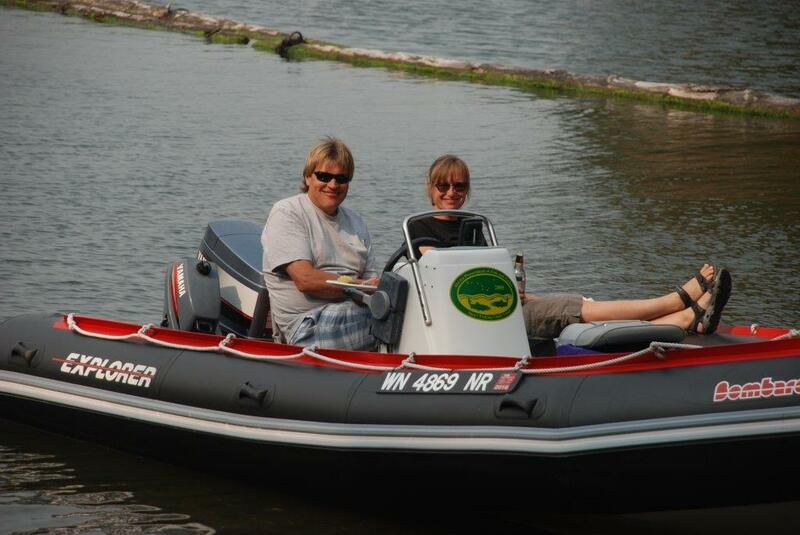 We will be staffing a start and finish boat as well as several mark boats. 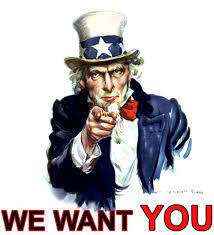 Dale Jepsen One Design Needs You! Please consider coming out to volunteer for this year's event. We need folks on shore just as much as on the water. 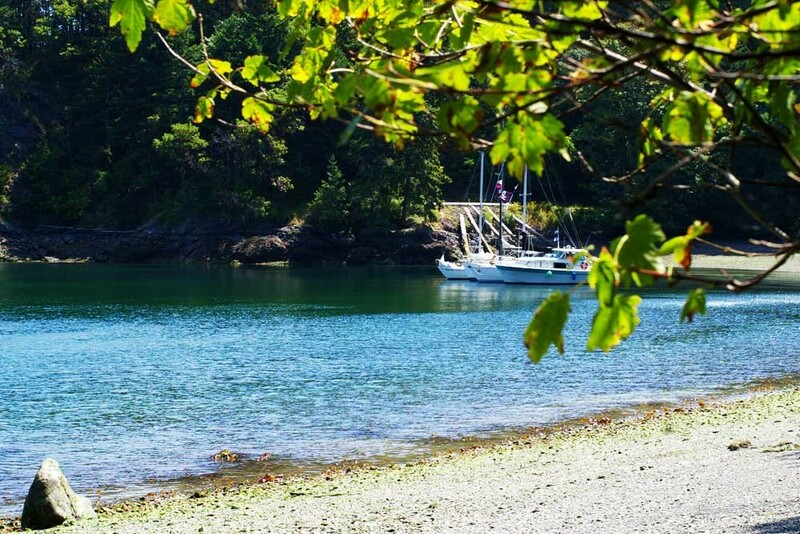 Please consider spending one or 2 days with us for a couple hours on shore, or several hours on the water. The event takes place Saturday and Sunday, September 19th and 20th. If you would like to help us, please contact me at byclaserfleet@yahoo.com. It will be MUCH appreciated! BUCCANEER'S CRUISE AN ENORMOUS SUCCESS! Nicole and Adam Jordan deserve a huge thanks for running extensive behind-the-scenes set-up and keeping things at a well-oiled-machine like smoothness... as well as Tom Day and our own Commenormous!! None of this woulda been possible without them!! Check out the great pictures below! 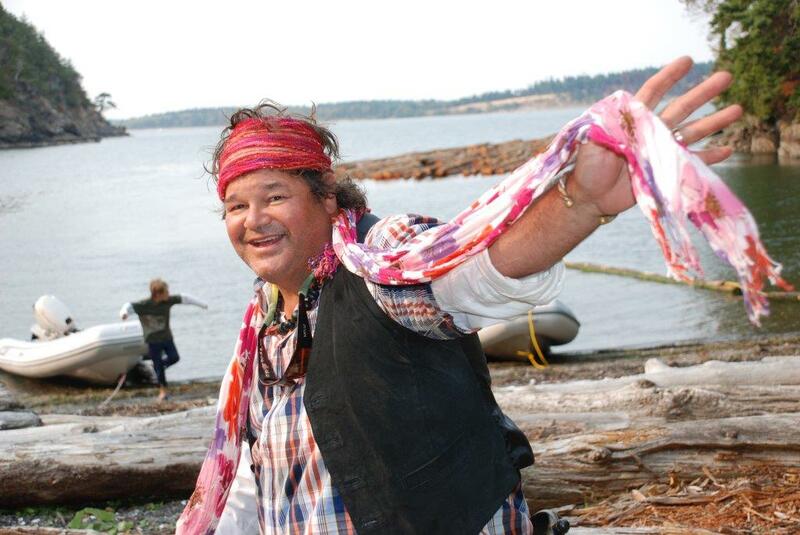 "A Celebration of the Salish Sea"
For those who have not yet signed up for Poets Cove, please go to the Cruising Page at the BYC Website and sign up. We need to confirm dinner arrangements for Saturday night, and you want to make sure you get your favorite slip! Click here to read all the details and to reserve your spot! 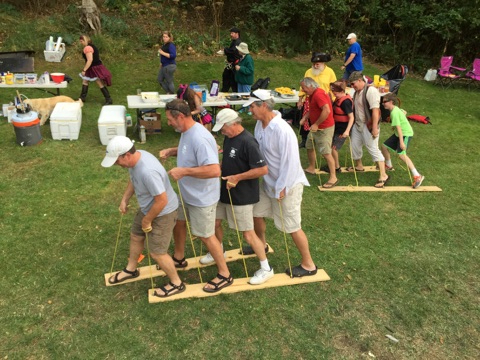 The annual Commodore's Picnic will be held September 12-14 at Inati Bay. This event is fun for the whole family and you won't want to miss it. More details to follow soon. To register, go to http://cruising.byc.org/. For those members who were able to make it over to Inati Bay, with their boat or by shuttle, the Buccaneer’s Cruise was a blast. 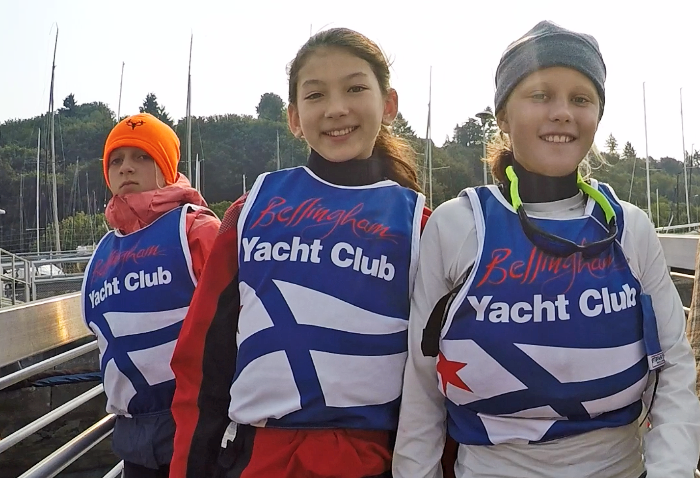 Although there were conflicting events last weekend: Start of the BYC Desolation Sound Cruise; the BYC Youth Race team at Seattle Yacht Club’s Jr Olympics; and AYC’s Northern Century Race, the event drew 25 boats in a spectacular raft-up with around 120 members and guests. It started off with Friday Night Beach Movies “Goonies” complete with popcorn, candy bags and over-sugared sodas for the kids. By the time Rick Laursen worked out all the kinks with the sound system (again! ), the movie started late so we decided not to show the second feature. On Saturday, about a dozen members coordinated with Randy Nulle for the shuttle over and back. I went back on Tom Day’s landing craft shuttle to pick up Gary Smith and his band, the Rocky Vasalino Show, the Zig Zag & Rags Clowns, and a boat full of sound equipment and ballons. 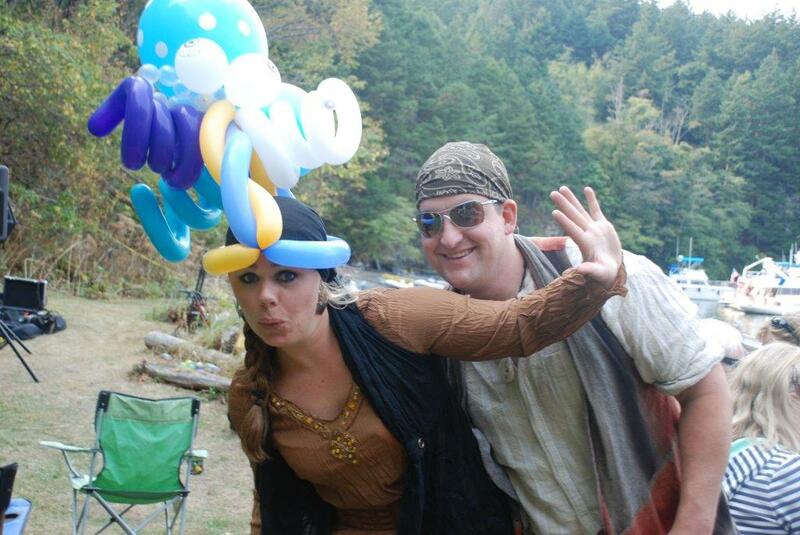 When we returned to Inati, Co-Chairs Nicole & Adam Jordan, along with Donna Olsen had the Treasure Hunts in full swing. Then, once Electrician Mark Santosuosso ran the power cords and fired up the generator, the band started rocking and the clowns started clowning. Steve Hayward had the Buccaneer’s grill at full throttle, with the help of Bruce Hamilton, Katy Day on Caesar, Linda Lavine, and Monica cranking out the most amazing fresh Dungeness crab tostadas! Although the party was still in full swing just before sunset, the band had to do their final encore in order to catch the transport back to Bellingham. The evening turned calm, and Dwane Jones started a little acoustic jam. Late in the evening we fired up the second movie feature… “The Princess Bride”. On Sunday, yours truly got up a littler earlier than those who had partaken a bit more, and headed to shore to prepare the Commenormous Breakfast with help from Tom Day and Chris Jacobs. It all came to a close around noon, and we packed out what was packed in, and restored Inati Bay to its majestic beauty. The Buccaneer’s Cruise planners are looking to move this event during the July full moon where the sun is a bit higher here in our northern hemisphere playground. So, it you missed this year’s event, start working your plans to make it next year. As we wind down the summer cruising, I’d like invite all members and their guests to the Commodore’s Picnic and Sailboat Race at Inati Bay on Saturday September 12th. This is a casual and fun end to the summer as my term as Commodore winds down. Please plan to race, cruise or take the shuttle over for some great food, games and music. I know there are some things that I forgot to mention, but I’m at SeaTac now with my Spokane flight ready to board in 10 min. An aerial view from the south of Dodd Narrows near Nanaimo, BC, was the subject of last week's photo. No one submitted a correct answer, Bud Hansen suggested a nearby harbor. This week we see a large waterfront facility. If you know the location, send your answer to drsteveross@gmail.com. Submit Stories by Noon Mondays to jibsheet13@byc.org. Copyright © 2015 Bellingham Yacht Club, All rights reserved.